The Road Transport Department (JPJ) has nabbed nine jaga kereta individuals in a special operation on Saturday, the New Straits Times reports. The joint operation with the police, National Anti-Drugs Agency and Immigration Department was carried at eight locations in KL city and one in Shah Alam. The city centre locations included Kampung Baru, Jalan Medan Tuanku, Jalan Dewan Sultan Sulaiman 1 and Jalan Ampang. The Shah Alam operation took place in Uptown Section 24. Three of the suspects tested positive for drugs, while another suspect is a foreigner who had no valid documents, said JPJ director of enforcement Datuk V. Valluvan. They were aged between 28 and 53. “Authorities monitored the suspects’ activities for three days and carried out operations on Friday, from 7pm until 7am yesterday (Saturday). This illegal activity has become a public nuisance. 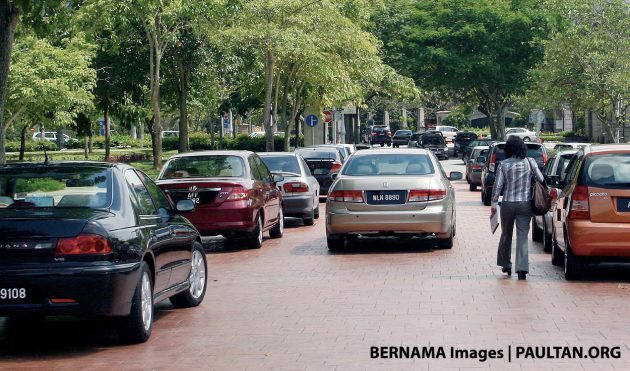 Whenever members of the public park their vehicles by the roadside or near the buildings, these unscrupulous people would come and asking for a parking fee,” said Valluvan, who added that the jaga keretas charged up to RM15. They will be charged under Section 50 (3) of the Road Transport Act 1987 for extorting money from motorists, the first time in history that the section will be used, the JPJ man revealed. Valluvan added that JPJ has identified more hotspots and will continue to carry out operations to curb the illegal ‘jaga kereta’ activity. Those with info can tip off the department via its official website. About time, we say. The jaga keretas don’t own the public parking lots, and none ‘take care’ of your vehicle when parked. Motorists only pay these undesirables (an exorbitant sum for public parking that’s otherwise free outside of business hours) out of fear that their cars will be damaged if they don’t comply. Extortion, as charged, is exactly what they’re doing. Next stop, Changkat Bukit Bintang? For 20 years, we all suffer from jaga kereta boys. Hundreds of them. In Bangsar alone got about 10 also. Now they harrass for RM10. No more RM1. We Malaysians are forced to pay RM10 even at night also. And JPJ catch only 9? The whole Klang Valley, only catch 9? If I go around one night, I can catch about 100 jaga kereta boys. Yes, jpj should do more to go after these jaga kereta guys. Its a good start, and hopefully they will go all out and get rid of these nuisance once and for all. Why so many dislikes? All dislikes came from Albert Yong? most of them are the abangs abangs who have no jobs and lepak and rilak is their culture. JPJ got thousands of enforcement officers who do road block. Tahan 100 cars, only issue saman to about 10 cars. The other 90, free duit kopi. JPJ got manpower to cari makan and duit kopi but got no man power to protect the rakyat. Thousands of people have got their cars badly scratched by these people because we refused to pay. Why you replied to your own comment? 20 years?..they’ve been around since the 1960’s. Why bother catching them? Send them straight to hell! Their disappearance would not be missed, in fact it will be celebrated. In 20 years, JPJ has caught only 9? Can we call police to take action, instead of JPJ? Extortion sounds more like a crime that handled by PDRM. Can call 999 for these kind of cases? Can the PDRM take action? Yes, I proposed all these jaga keretas be hanged. Most of then are addicts. They need treatment for their mental health issues, not a prison sentence. Yeah! lock them up 4 good/ punish them 4 decades of hard labour like road works on entire country. jom terjah Jalan Alor & Imbi Road. Why not catch them yourself? Now how about other areas? Good. Very good. Continue with your efforts. We understand that everyone must ‘cari makan’ somehow, but no amount of sugar-coating can conceal the real nature of this practice; public blackmail and extortion. There is a special place in hell reserved for these ‘jaga kereta’ imbeciles. Stealing is one matter, but to steal under the pretense of ‘helping’ is beyond despicable. What the above Albert Yong said is correct. Tangkap 9 shj, don’t kidding us. They got plently area have jaga kereta boys. The method is want to take action or not for every days nights. Jangan jangan tangkap berapa hari shj. Ataupun ini area boss ada kasi donation, so exception. They been ignoring us for many years, this time must rip them off permanently!!! enforcement not for publicity stunt only, jangan “hangat hangat tahi ayam ya”. Just a friendly reminder. Jaga kereta is a huge problem everyone knows. It’s elephant in the room. Mana-mana KL pun ada. Makcik selling pisang goreng also know lah. Anyway, this is small-small fry compared to what happened in Putarjaya…..that made billion of RM magically disappeared…. How about Johor baru esp near jln ah fook and the near the Johor baru sikh temple area.A lot of hooligan looking jaga kereyas harassing motorist.JPJ must put an end to this extortion in Johor baru also. Process Improvement : How abt those extorting money from motorists during roadblocks & illegal traffic Ops. Since there is extortion involved why is not police taking nec action to get rid of this hooligans harassing the public. Only caught NINE? This is ridiculous! What did JPJ do? Raid their own car park? Good lah. More enforcement, more publicity. This should scare them off. This is what the taxpayers’ money is for. Tajuk cerpen, Ops Bersepadu. Cerpennya begini; JPJ tahan orang “jaga kereta”, AADK buat ujian kencing dan Imigresen proses wargasing haram. Masa tu, JPJ tahan lima “ulat” yang sudah ditandakan. AADK bawa 15 kit ujian saja. Uji 15 orang, tujuh terbazir, lima negatif dan tiga positif. Pihak Imigresen menyiasat, hanya satu wargasing haram ditahan. Makanya terkumpul sembilan orang suspek. Sekianlah cerpen, terima kasih. Catching only 9 does not make sense ……….. I was gonna suggest changkat. There should be a special email or what’s app to complain to for victims.